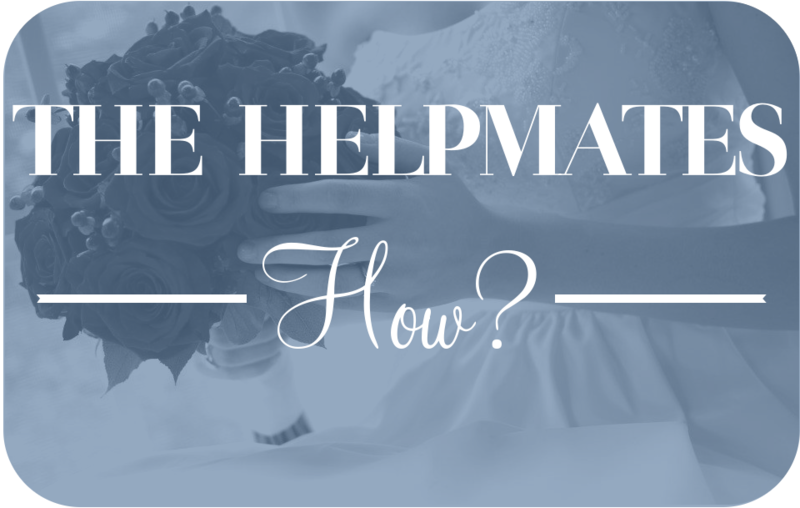 Over the past week we’ve explained why wives are called to be helpmates, and what it means to be a helpmate. Now I’m going to list a few practical ways to be a better helpmate that I’ve learned through my marriage, though it is by no means an exhaustive list. After #1 and #2, they aren’t in any particular order. 1. The most important tool to becoming a better helpmate – that perfect fit for my husband – is scripture. This is also the thing that I fail at most consistently. But if I’m not in the Word, then how can I expect to put into practice the behaviors & attitudes that exemplify a helpmate? I need to get into the Word daily & pray that God will sanctify me into the woman that my husband needs. Love is a conscious choice to sacrifice myself for Steve. Just as God loved the world in such a way that he sacrificed his only Son, I must love Steve in such a way that I am willing to sacrifice my wants & desires for Steve’s or for what is best for our marriage as a whole. 3. Be spontaneous! Don’t let your laundry or homework plans keep you from going out to watch a movie or get ice cream. Set up the tent in the living room & spend the night in it. Even if you need to get up early, don’t keep yourself from staying up talking to each other deep into the night. Have pillow fights & tickle wars, play hide & seek, read aloud together, and just be yourselves! Revel in the knowledge that you get to live with your best friend. Being a helpmate isn’t just about doing dishes and vacuuming! 4. Learn more & more about each other – ask questions! One of the greatest joys of being a helpmate is getting to know your spouse better than anyone else does. I learn new things about Steve every day, and it fuels my love for him, and my desire to become a better helpmate for him. One silly & embarrassing example of this is that just last month I discovered that Steve likes mayonnaise on his sandwiches. I’ve been making him sandwiches for over a year without a clue, until one day I finally thought to ask him, whoops! 5. Your budget is important. Decide on one together & stick to it. We got an awesome excel spreadsheet from my brother-in-law that’s helped us a lot in budgeting. Make sure you have common goals for spending, saving, & getting rid of debt. Since buying groceries is my job in our marriage, it’s my job as Steve’s helpmate to stick to the budget that we’ve planned, which for me requires a lot of pre-planning time. But it’s time that I sacrifice gladly (most weeks) because I know I’m serving Steve by being a good steward of our money. 6. Husbands need encouragement. It may be an affirmation of his leadership of your family, or something as small as thanking him for taking out the trash, but encourage him often. Your words mean more to him than anyone else’s, so keep them positive & uplifting! When you do need to offer less than positive opinions, don’t whine or complain. Being a helpmate does not mean nagging. No one needs that, especially not your sweet hubby. 7. Make spending time together a priority, but keep your friends close, too. Being together is very important, but that doesn’t mean that your friends get tossed to the side. Steve has always been great about letting me have girl time whenever I want, & I usually use his guy time as an excuse to try out new recipes for him & his friends. You don’t want your spouse to be your only relationship, that’s not what marriage is about. Also, building a community of married friends is important. Steve & I get together with at least one other couple every week to hang out, and I’m in a young wives Bible study. It’s always encouraging to hear from other women about struggles & successes in their marriages – it’s such a relief knowing that I’m not the only one having trouble sticking to the grocery budget! Other wives (and single friends) can be very instrumental in encouraging me and keeping me accountable to growing in my role as a helpmate. 8. Get a mentor who is older than you & has been married for a few years – a woman who will be real with you & doesn’t hesitate to call you out when you’re being stupid. My mentor has been so encouraging to me in my walk with Christ & my training as a godly wife. I can get great advice from my mom, my sister, or my friends, but it’s different coming from someone who was in my shoes just a few years ago. Since Steve works in the college ministry at our church, we don’t get to attend the young married Sunday school class. It’s hard for us, since we aren’t college students anymore & we don’t connect with them in the same way that we do with other couples. So, when I was looking for someone to disciple me, I found another pastor’s wife. She’s been where I am & is excellent at encouraging me in my service alongside Steve in the college ministry. I strongly encourage you to find someone who has been where you are & meet with her weekly! 9. Don’t forget that your husband will change & so will you – marriage is dynamic. My husband is a different man than the one I married, but not in a bad way. Being a husband has changed him, taking 12 hours of seminary has changed him, growing in the Lord has changed him, and growing closer to me has changed him. I can see the changes in him better than the ones in myself – like his new love for writing slam poetry, & his seminary studies shifting some of his theological views – but I know that I, too, have changed from the woman he married. Don’t let that change freak you out. Enjoy the man he was, the man he is, and enjoy watching the Lord mold him into who he’ll be next, as he molds you, too. It’s amazing to watch God change who I am as a helpmate to fit Steve as his needs change over time. I hope this post & this series has been encouraging to you as a wife, fiancée, or single woman! We would love to have your feedback. Were these suggestions helpful to you? Also, what are some ways that you’re striving to be a better helpmate to your husband or fiancé?